The splendid 3rd century BC pebble mosaic depicting Bellerophon, Rhodes Archaeological Museum. Later this year, it will be my first time to participate in Peter Sommer Travels’ two-week Cruising the Dodecanese, which will take us from the island of Samos southwards through the entire Dodecanese archipelago, ending at Rhodes, which is the most famous island in the group – for several historic reasons. As an archaeologist specialized in Byzantium and the Middle Ages, I should probably be expected to write about the glorious history of the Knights of Rhodes and what they left behind. I will do so before long. However, could anyone ignore the magnificent mosaic shown on the left, now on exhibit in the charming garden of the Archaeological Museum in Rhodes town? I certainly can’t. 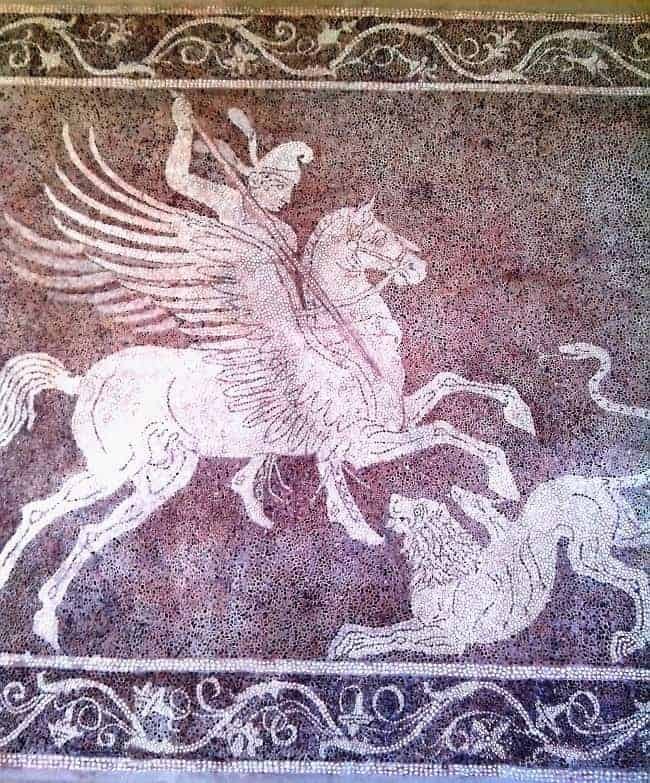 What you are looking at is a pebble mosaic floor, depicting the mythical hero Bellerophon upon his winged horse, Pegasus, about to slay the Chimaira, the fabulous and monstrous creature from Lycia, combining features of a lion, a snake and a goat. The figures are rendered with white pebbles against a dark bluish background, while some of the outlines are stressed with a fine lead strip, a technique that is common among the pebble mosaics of the Hellenistic world. 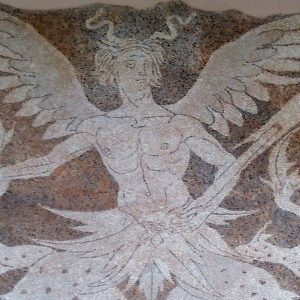 As a matter of fact, Bellerephon and the Chimaira, like all the mythical beings and heroes described by Homer in the Iliad or elsewhere in Greek literature, would make for a fascinating and exciting story to tell. That, however, is for another post (meanwhile, you can find out more by using the traditional method: googling!). 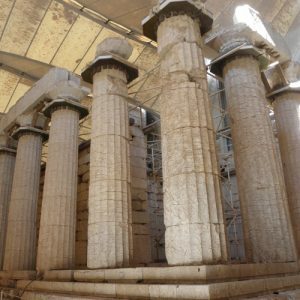 Here, I will focus on the houses of the Hellenistic period and their interior decoration, especially on the striking example of the highly prosperous city of Rhodes. 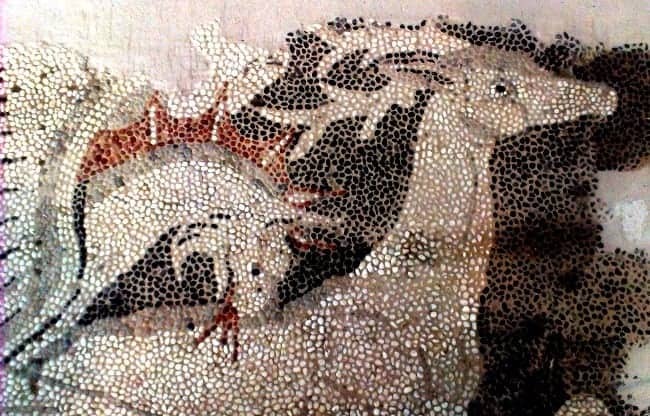 Griffin tearing apart a deer on a 4th century BC threshold mosaic from Pella, capital of the kingdom of Macedon. Pictorial pebble mosaic floors, depicting floral and mythical themes, first appeared in the Greek world at the end of the 5th century, in public buildings and private houses of various cities, among them Olynthus, Eretria and Sikyon, in Macedonia, Euboea and the Peloponnese respectively. Around the middle of the 4th century, the rapid development of several factors – namely technique, ornamental conception and the spatial structure of the depicted themes – radically changed the art of such two-dimensional representations. The introduction of coloured pebbles changed the figures’ perspective and plasticity, while the themes, no longer arranged around a central motif, but in a linear progression were henceforth readable only from the specific intended vantage point. 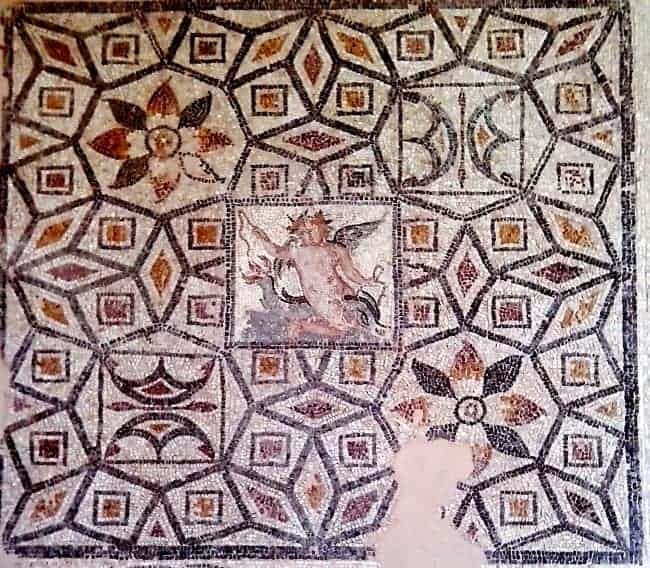 Thus, an original and different sort of composition, the unified mosaic design, became the new and the only form of large-scale representation, first in the luxurious private homes of the Kingdom of Macedon and soon after in cities across the Hellenistic world. Deer hunt mosaic from Pella, shown from its intended viewing perspective. Ca. 300 BC. Of course, that does not mean that all private houses were decorated with mosaics, nor that – where present – they occurred in every room of the domestic environment. The majority of preserved floor panels have been found in andrones, the men’s quarters of the Greek peristyle house, in which the rooms were arranged behind the colonnade of a central courtyard. In these houses, the andron was the main hall where the owner and his friends gathered, reclining on couches along the walls, for the symposium, a kind of private feast central to social relationships. The private andron was an architectural and cultural imitation of the banqueting halls of public buildings. The walls were frequently decorated with multi-coloured plaster, often imitating marble panels (similar to the later Roman First Pompeian Style), and the floors and thresholds bore brilliant mosaic representations of the mythological world, including gods, hunting scenes, fighting animals and mythical creatures; a reflection of the noble owners’ wealth and aesthetic preferences. 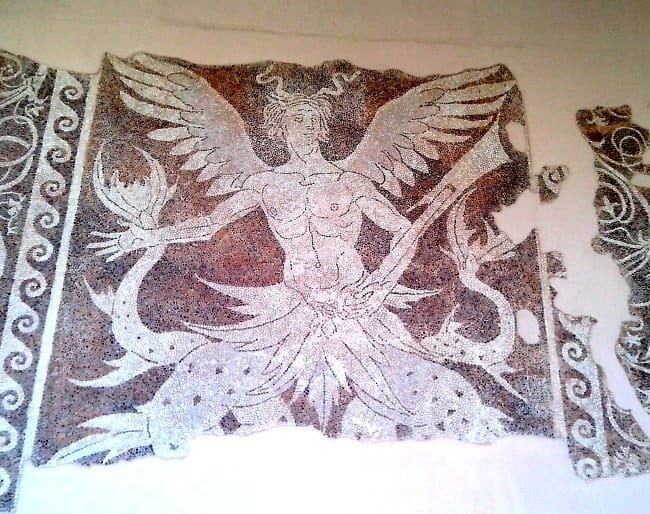 A 3rd century BC pebble mosaic from Rhodes, depicting a triton, another mythical creature. From ancient times, Rhodes, due to its geographical position on the south-east extremity of the Aegean, was one of the most important trade centres in the Mediterranean, in a perfect location at the crossroads of maritime routes between Egypt, Cyprus and Phoenicia,the Aegean and the Black Sea, Italy and North Africa. 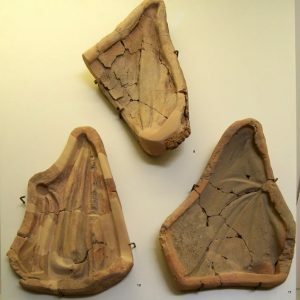 During the Hellenistic period (ca. late 4th to 1st centuries BC), the Rhodian merchant navy was among the largest in the Hellenistic world and from the 4th century BC the island was the chief exporter of wine, olive oil and cereals. Although maritime trade and commerce were key contributors to the island’s boom and “golden age”, two further factors played a major role. One was the synoecism (more on that phenomenon in Heinrich’s posts on Kos and Knidos) or refoundation of the city in 408 BC – entailing a complete urban redesign with new fortification walls, a new city plan based on the Hippodamian system, an extensive and well-constructed sewage and water supply system and finally five well-protected harbours. The second was, of course, politics; the island’s special aristocratic government based on an advanced system of maritime laws, the early (306 BC) peace treaty with Rome and the successful repulsion of Demetrius I Poliorketes, during the siege of Rhodes in 305-304 BC. Statue of a nymph from a private home in Rhodes, ca. 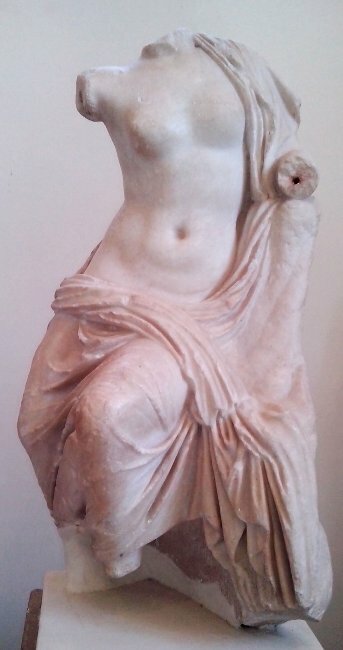 100 BC – a characteristic example of Rhodian-school sculpture. During the course of this period – when Greek culture was spread throughout the Near East, Asia and to all the new Hellenistic kingdoms – the flourishing Rhodian “school” of art produced excellent works of sculpture and other visual arts of a vivid triumphal and decorative character, now recognised as the “baroque” and the “rococo” styles of Greek art. The most famous example of these achievements is the Nike of Samothrace, considered the work of a Rhodian artist. 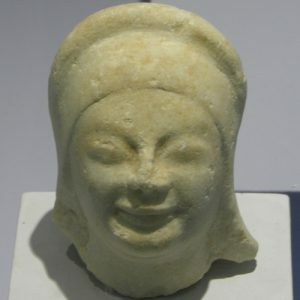 Thus, the renowned Rhodian sculptors were centrally involved in the development of new aesthetic values and the Rhodian sculptural tradition was soon integrated into the cultural environment first of Republican and later of Imperial Rome. At its highest peak, the city of Rhodes expanded southwards from the Ancient Acropolis and its houses acquired large dimensions and ornate interior decoration, especially in the reception halls and the andrones. Small-scale statues of various themes decorated the gardens, nymphaia (fountains) and public buildings as well as the courtyards of the mansions inhabited by the Rhodian maritime aristocracy. An elaborate Rhodian floor mosaic with a central scene showing Eros astride a dolphin. 4th century BC. 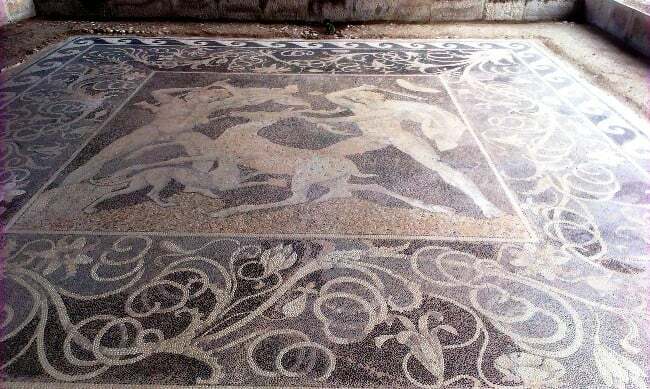 A great number of monumental pebble mosaic floors depicting birds, dolphins, griffins and mythological scenes have been brought to light in the extensive Hellenistic district of the city, all of them belonging to the interior decoration of private homes. They date between the 4th and the 1st centuries BC. It has been suggested that when the political and commercial power of Macedonia, where the art of pebble mosaics had been pioneered, was waning, mosaic workshops were transferred from the two Macedonian capitals (Aigai/Vergina and Pella) to then more significant centres, such as Alexandria and other Hellenistic cities, including Rhodes, resulting in the museum’s extraordinary wealth of such works. To sum up, these exceptional and monumental compositions provide us with valuable information not just about the evolution of the art of making pebble mosaics, but also about their relation with the decorative schemes of private houses during the Hellenistic period. They confirm and illustrate the b(l)oom period enjoyed by Rhodes during this era of special economical and political conditions. Moreover, they are things of great beauty and fascination, to be cherished and enjoyed by those who get to see them. You can do so on our Cruising the Dodecanese. For the equally wonderful pebble mosaics of Pella, the Macedonian capital, you can join us on one of our tours exploring the North of Greece.